"Compassion and empathy for all is what the future of this planet is dependent upon." 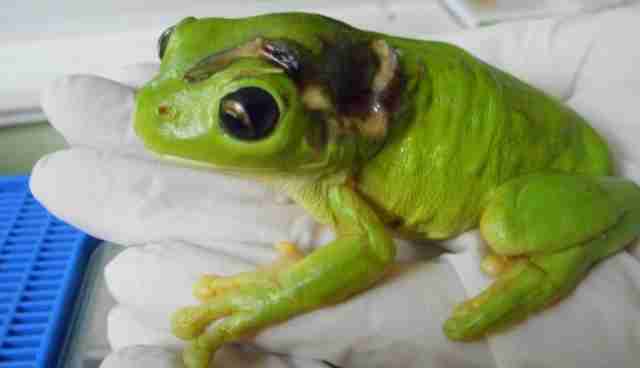 Not many frogs survive a close encounter with a lawn mower. Still fewer are flown hundreds of miles away for urgent care. 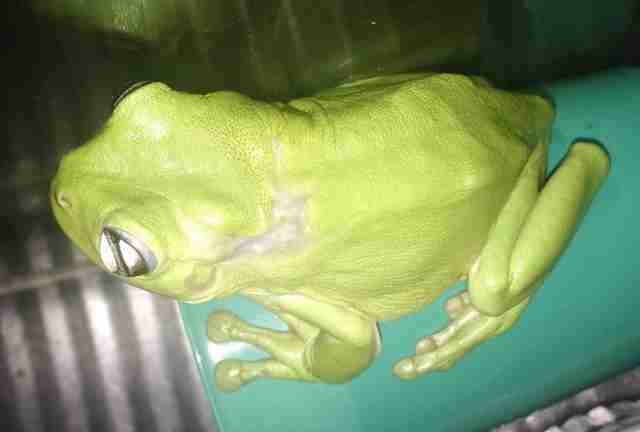 But this was no ordinary frog - green tree frogs are becoming increasingly rare in their native Australia. And the woman who ran over this one in her yard in early April knew it. After realizing she had cleaved off the top of the frog, Min Tims from Mount Isa, Queensland, called her niece. The pair knew they had to get the frog to a rescue hundreds of miles away. And, so, they connected with a chain of caring that spanned an airline, a dog transporter and a courier company. Rex Airways agreed to fly the frog. A group called Dogtainers helped coordinate and custom package the animal, and a courier met the flight 500 miles away in Cairns. 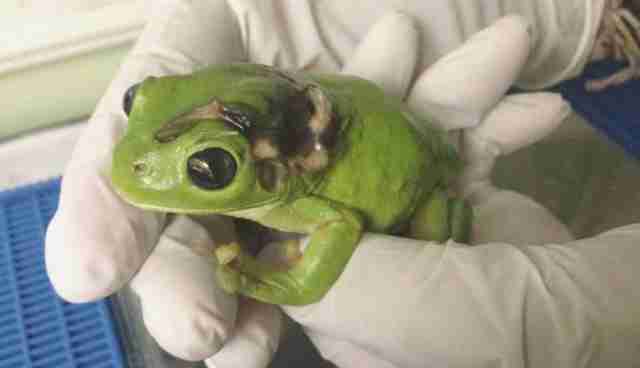 And, finally, staff from an animal hospital called Frog Safe picked up the patient from there. Then the frog found himself in even more extraordinary circumstances. "We knew that he had an underlying condition because he was out on the lawn during the day, but the wound itself was also infected and the tissues above where the blade had skimmed over the shoulder bone were necrotic," Frog Safe president Deborah Pergolotti tells The Dodo. In other words, this hapless frog was in dire shape. Hospital staff focused first on easing the animal's obvious pain. Then they set about a suite of alternative medicines and a couple veterinary drugs to clear up the infections. After a couple of days, the patient revealed an underlying condition: not one but two internal parasites." "He's doing great," Pergolotti says. "The wound has completely healed up and there is a bit of a scar there. His weight has picked up ... one extremely lucky frog indeed." Why go through so much expense for one tiny animal? The answer comes easily to people like Pergolotti. "Compassion and empathy for all is what the future of this planet is dependent upon," she says. "If people can nonchalantly turn away from someone who needs help - including small animals - then we as a species may not deserve to be helped ourselves." Pergolotti also cites the dramatic decline of many of Australia's frog species - she's convinced much of it is caused by the excessive use of chemicals but almost no "official" research is being done to prove this connection. If you would like to support Frog Safe and its mission to save countless tiny lives every day, consider making a donation here.